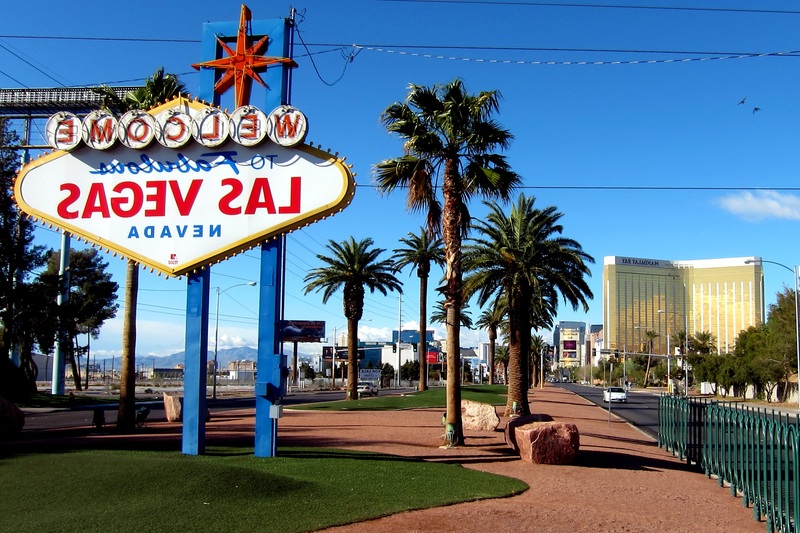 Wednesday, April 13, 2011: At 1000 we reluctantly leave Las Vegas and Suzie, Kevin, Jack and Tucker. The weather is clear and sunny with a temperature in the mid 70’s. With a bit of sadness we watched the iconic sign in the truck mirror fade into the distance. We were planning on heading to Bryce Canyon National Park, however after checking the forecast we decided to hit Zion National Park instead. 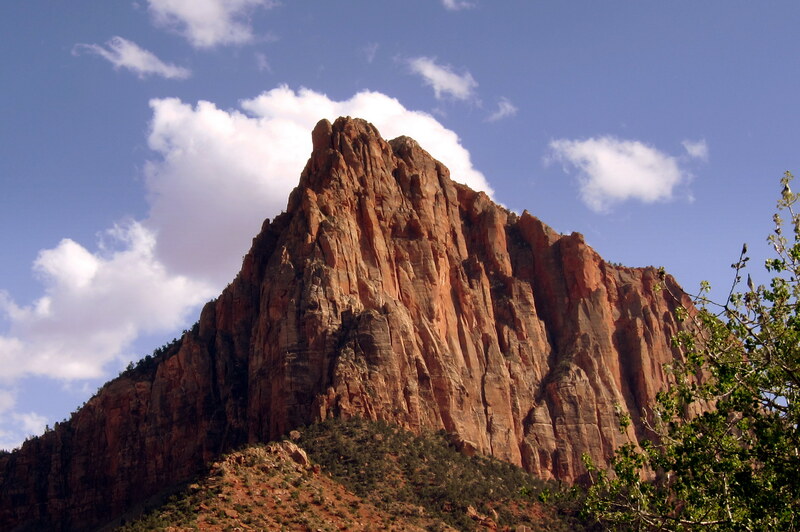 Bryce High-41, Low-20 and snow…..Zion High-72, Low 46 and sunny…..kind of a no brainer. 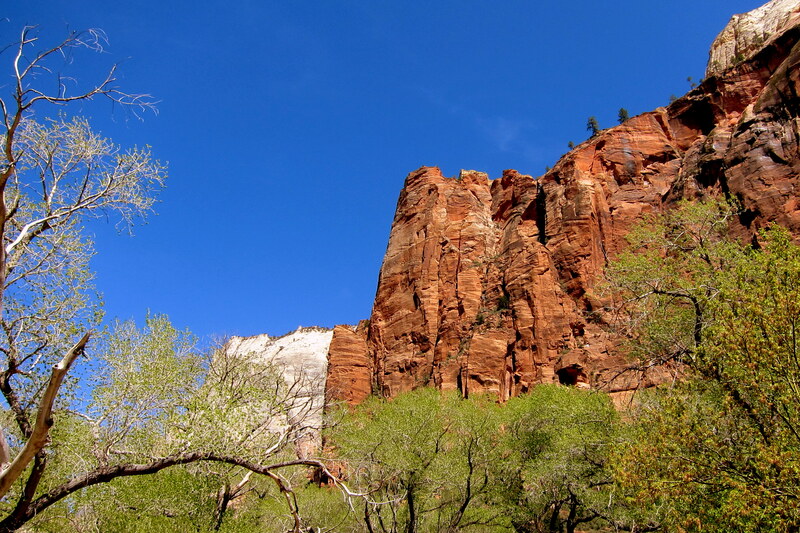 We certainly were not disappointed as Zion has become one of our favorite Utah National Park’s! But before we enter one of America’s premier National Parks I have an apology to make. I had been remiss in keeping these journals up to date and publishing them in a timely manner. Well I recently discovered that it hasn’t been my fault. 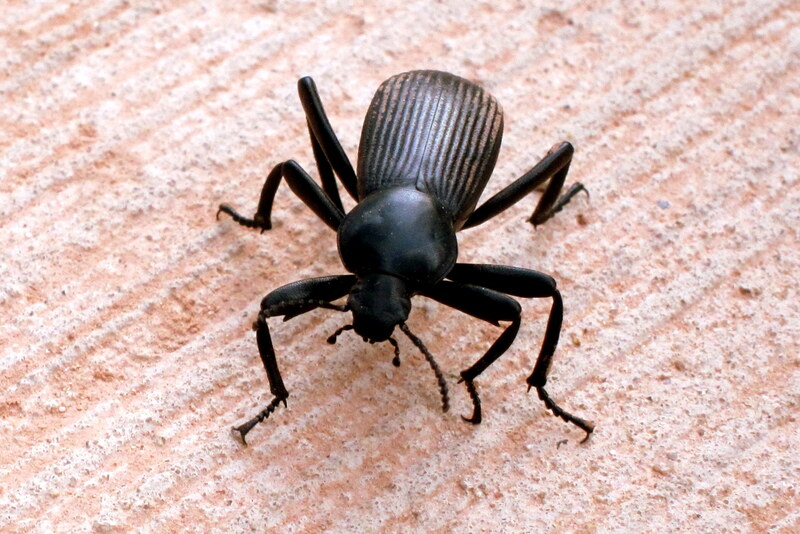 I had a bug in my computer. On I-15 we soon cross the Utah border entering the Mountain Time Zone. Following the Virgin River Gorge on UT-9 through Hurricane and Springdale we arrived at the park entrance. 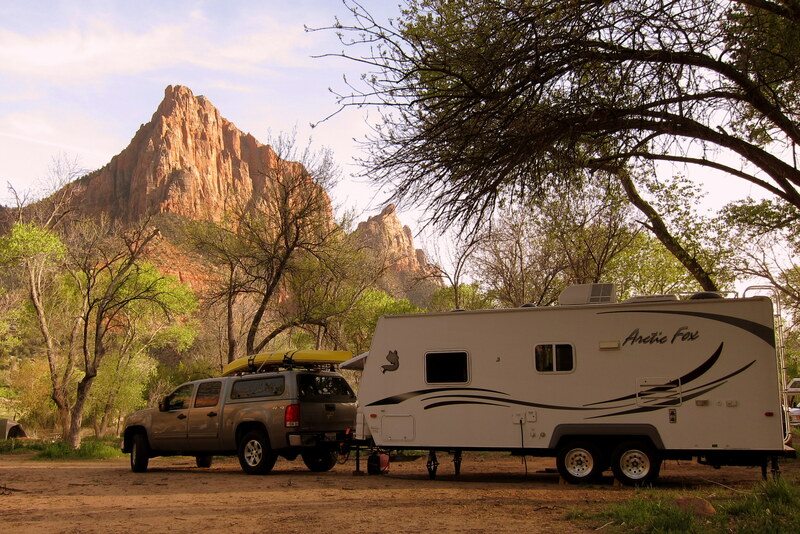 We selected a nice spot in South Campground and self-registered for a few days stay. 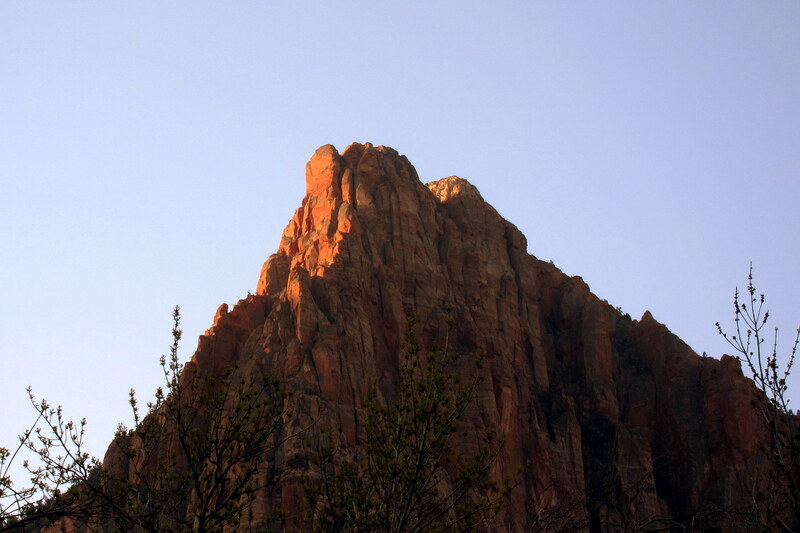 Thursday, April 14 through Saturday, April 16—Zion National Park, Utah: After a very restful night listening to the flow of the Virgin River we woke to bird song and the sun illuminating Watchman’s Peak. Soon we were enjoying breakfast while viewing this sight from our site. Being a weekday the Campground was sparsely populated. About half the folks in the campground were Europeans in rental campers. 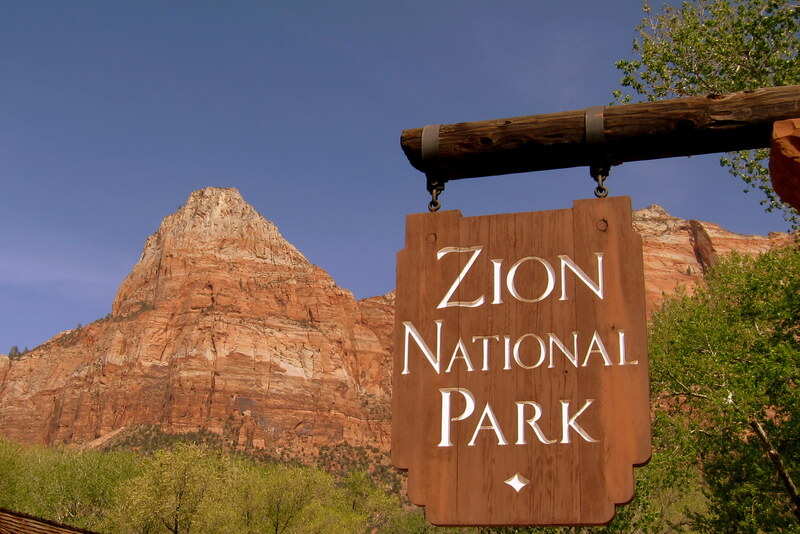 Apparently there had been a TV special shown throughout Europe that showcased some US National Parks and Zion was one of them featured. In addition there were big wall climbers and white water kayakers staying in the park and enjoying those more extreme sports. Most of the remaining where retired folks like us. 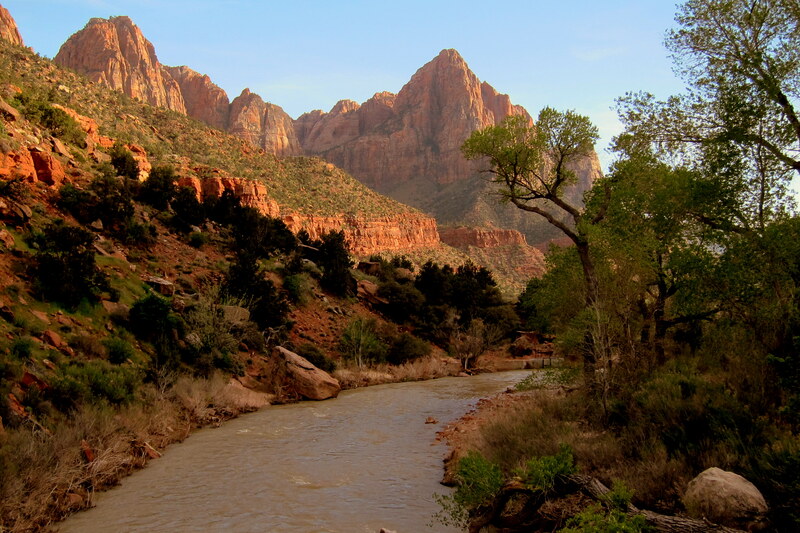 Zion canyon was cut to its present depth by the Virgin River. 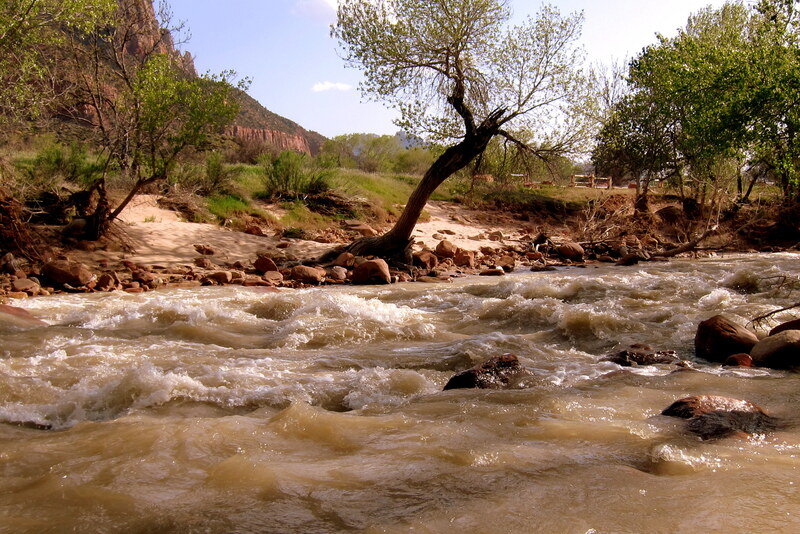 This normally placid river picks up intensity during spring snow runoff and the intense rain storms that drop moisture on the nonporous slickrock mesas. During this period of high and fast water the river carries along sand, pebbles and stones which conspire to rapidly erode the sandstone rock. 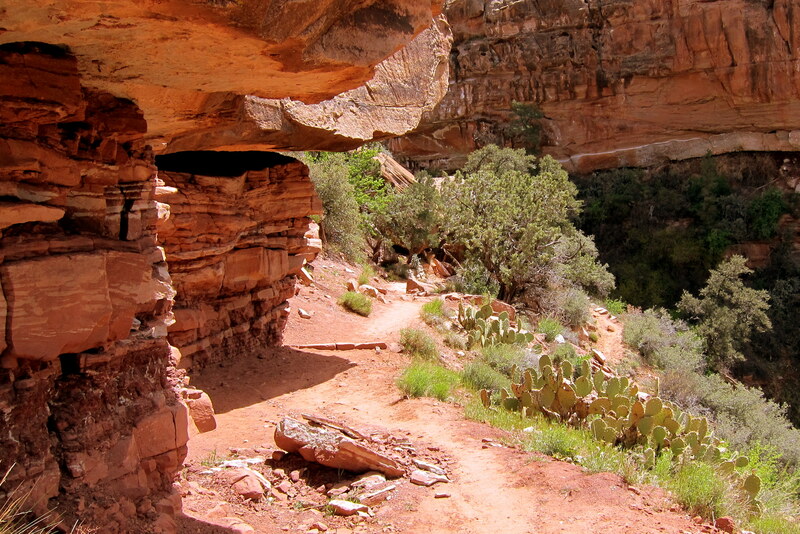 This action continues today deepening the canyon by a few inches each year. The constant battle between man and nature causes the park service to replace portions of washed out road. However the result is truly magical. This place is a photographers dream. 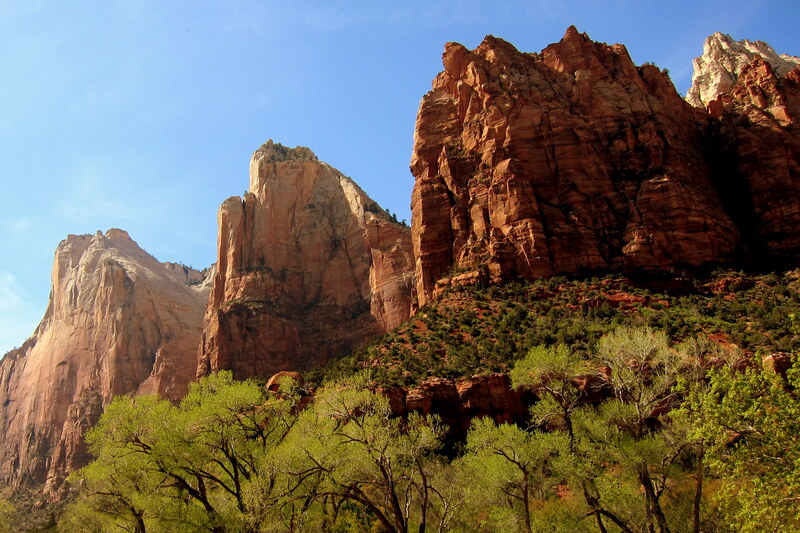 One truly cannot take a bad picture in Zion. If anything, the red rock, blue sky and brilliant spring greenery showcased in this magnificent park at this time of the year cannot be realistically captured on film. 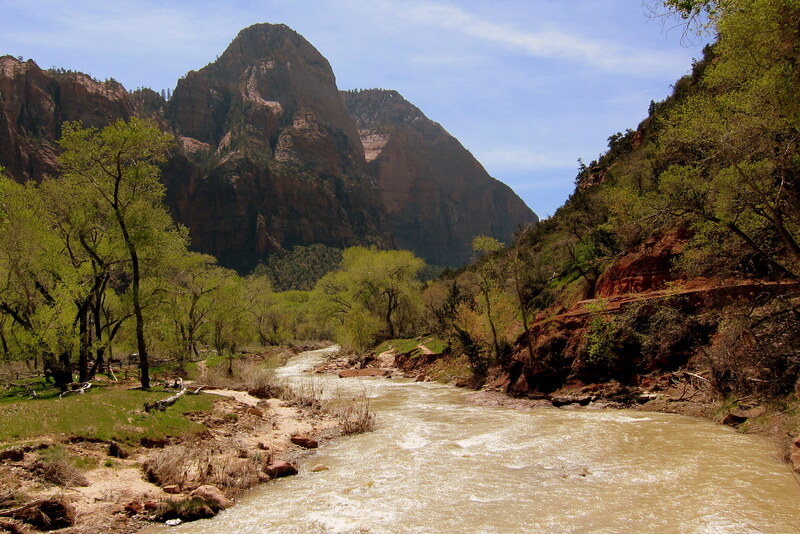 My photos do not do justice to the beauty of Zion. For the first day we decided to walk to the visitor’s center to gather some information on the park. 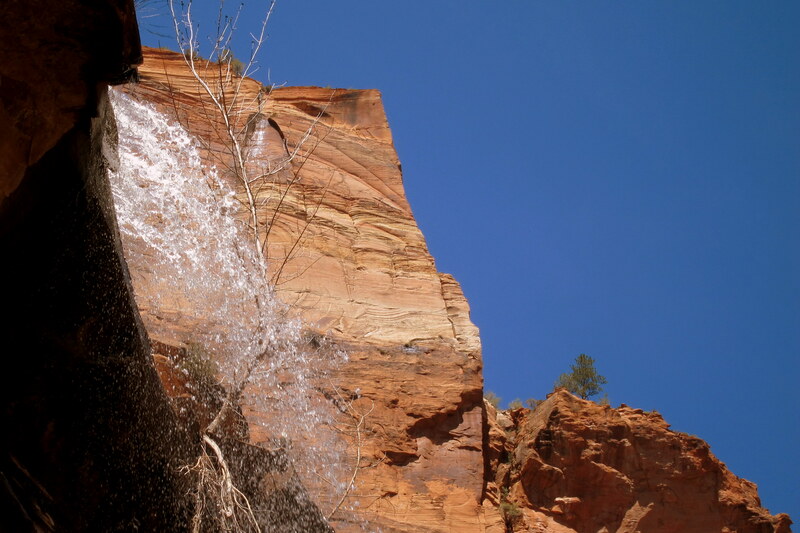 Zion does not sell bottled water but asks visitors to use refillable water bottles. Nor should they, the spring water was incredible! 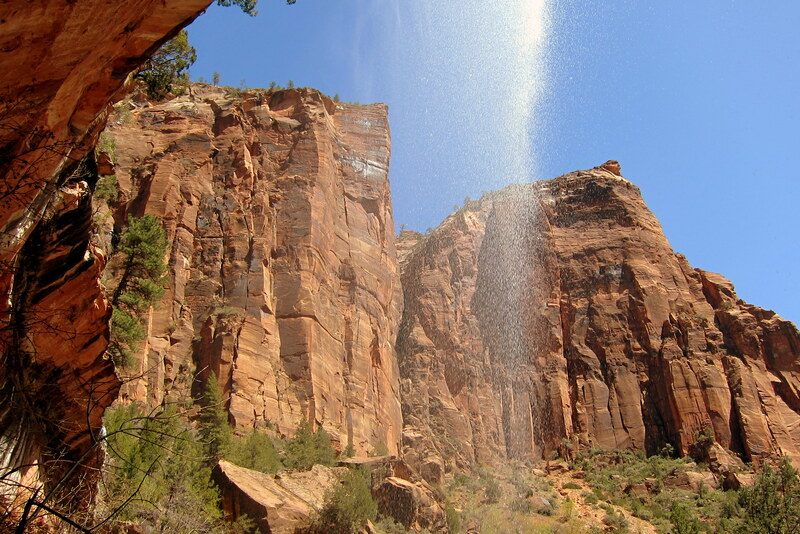 We liked it so much that we drained the remaining water out of our camper tank and filled up with delicious Zion Spring Water. In addition we filled all our water bottles as well as four gallon jugs we keep for emergencies……it is that good! The park has an incredible system of propane powered shuttle busses that connect most major portions of the park with the two campgrounds, the visitor’s center and the local town of Springdale. This service is free and very convenient…..in fact, I never felt a need to disconnect truck and trailer during our stay. After touring the center and associated gift shop we decided to take the shuttle into Springdale. 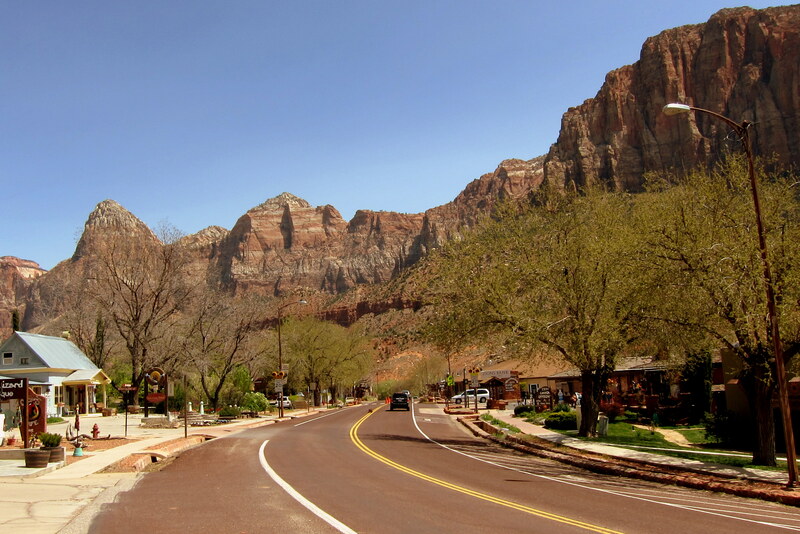 This quaint town is the un-official “Gateway to Zion”. 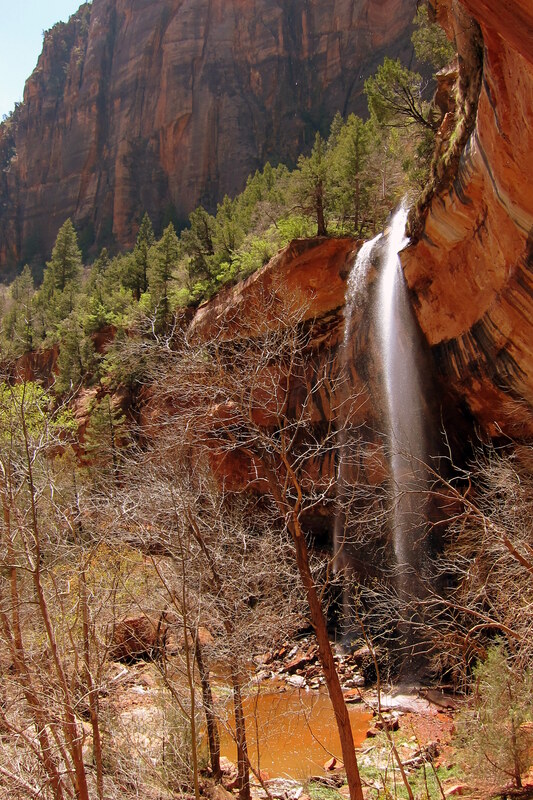 It features every amenity that the visitor would need including an IMAX theater that shows an incredible film on Utah’s National Parks. After walking around for a few hours we made our way to the local hangout, Oscars. 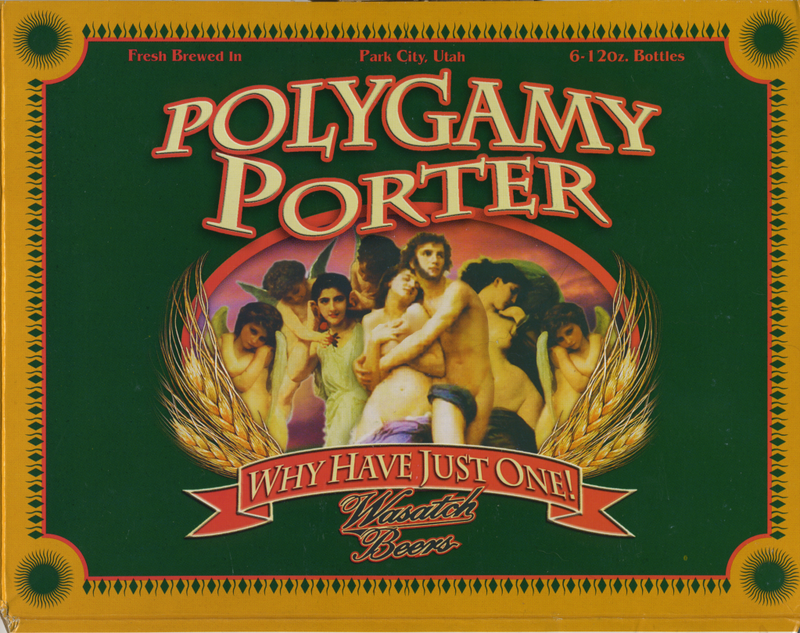 We enjoyed Fish Tacos, Sweet Potato Fries with “Fry Sauce” and a few Polygamy Porters. Back at the campground we walked part of the Pa’rus Trail until sunset, and then returned to the camper for happy hour…..easy to do in this park! The next day was Bill’s day to hike and Kit’s day to enjoy some peace and quiet. Kit went back into Springdale to finish exploring the town and I set out on the Watchman Tower trail. The trail was well maintained….and as an added bonus the trailhead was at the campground. It steadily climbed the flanks of Watchman Tower. 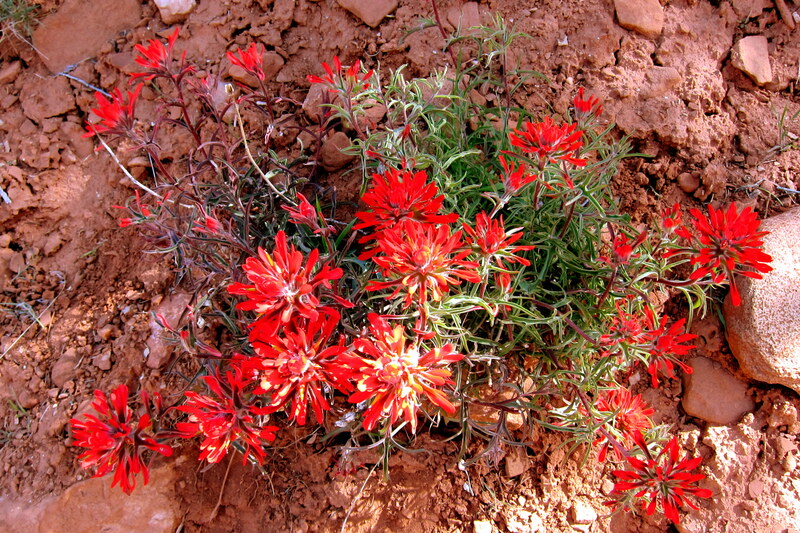 Just to show that Zion isn’t all red, white, blue and green I came upon this flowering bush along the trail. 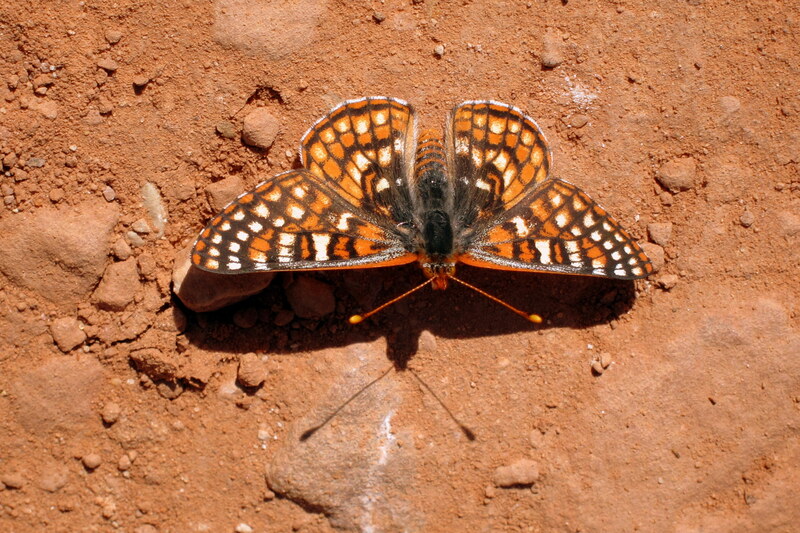 Nearby I noticed this little fellow enjoying the day. 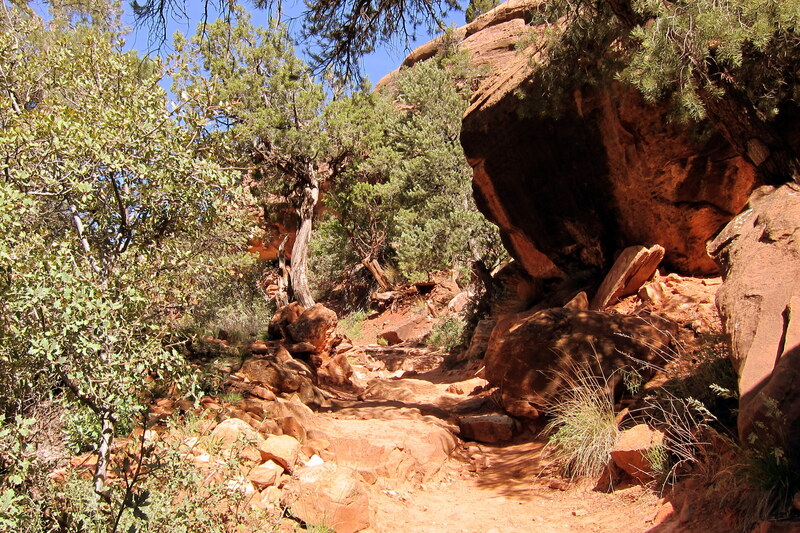 The trail continued upward, hugging the side of the mountain and in many places traveled under overhanging rocks. 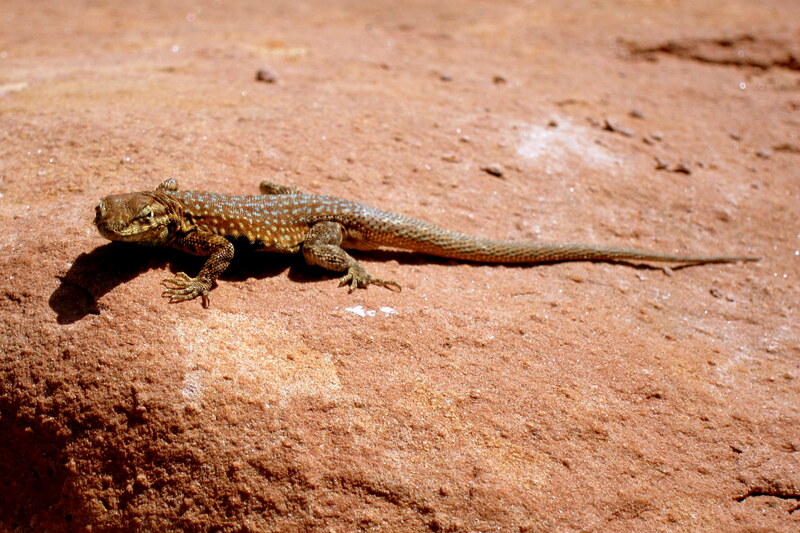 Soon I came to this fellow sunning himself on a warm spring day. He looked a bit surly; I guess peddling insurance for a living can sour anyone’s disposition. At the summit there were nice close up views of the famed Watchman Tower. And a bird’s eye view of the campground and the town of Springdale off in the distance. The smoke you see in the distance is from Kit’s credit card. 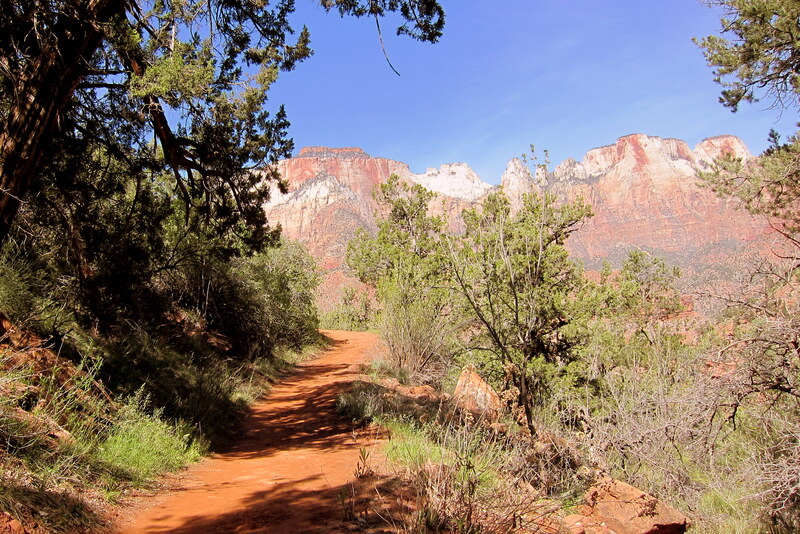 The trek was a nice mellow hike with many places to stop and just enjoy the majesty of Zion National Park. On the final day we took the shuttle up canyon to Zion Lodge. Kit found a comfortable leather chair to sit and read in and I took off on another hike…..the Emerald Pool Trail. It was mostly paved and only a few miles but it led to an incredible sight in this normally arid state. 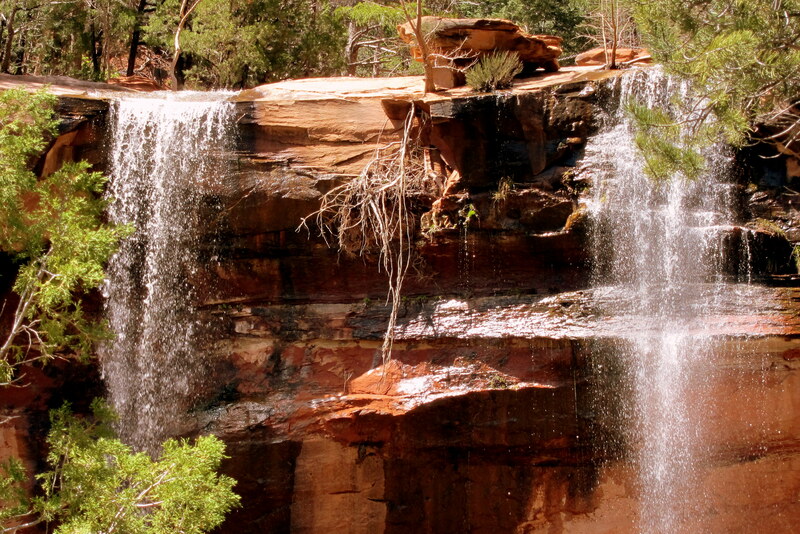 The triple waterfalls into the Emerald Pools. The trail leads behind the falls where everyone gets a bit damp. Beyond the lower falls the trail continues to the middle falls which is even more impressive. At this point the trail was closed due to erosion denying access to the upper falls. Another great hike in a great National Park! 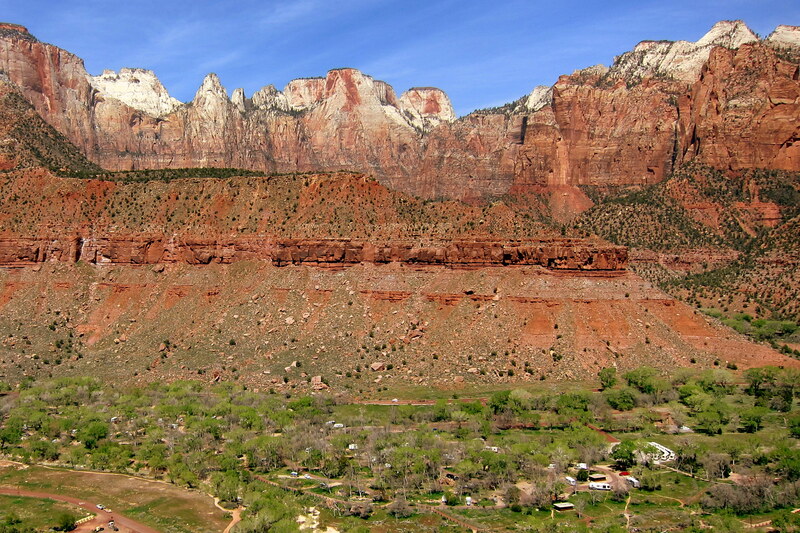 Returning to Zion Lodge Kit and I enjoyed a nice lunch on the deck overlooking the beautiful Zion rock formations. 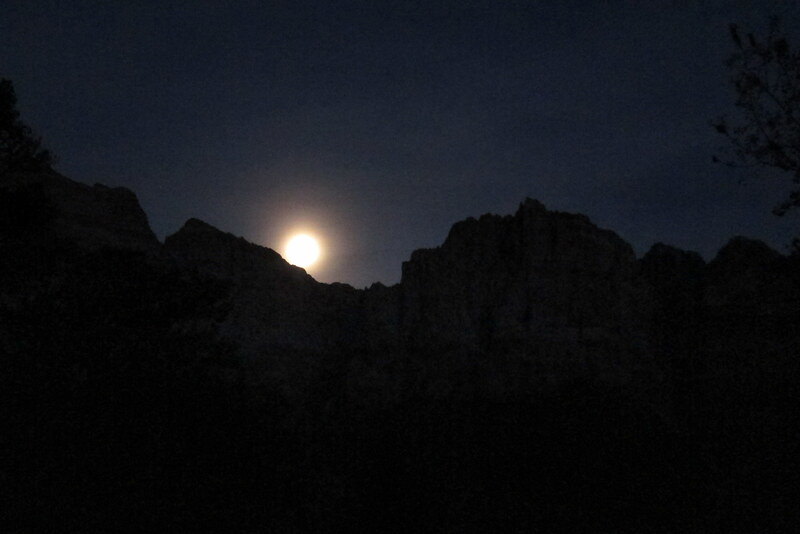 Back at our campsite and on the final evening in Zion National Park we enjoyed the moon rising over the canyon walls. There is way too many incredible sights for one journal issue…..stay tuned for more. Kit’s Nine Cents Worth: Little does he know; I hardly spent a thing on my tour through Springdale. It’s fun just to wander through the shops and chat with the owners. They all seem interested in talking to people from other states or countries and are eager to share their favorite Utah tourist spots with us. 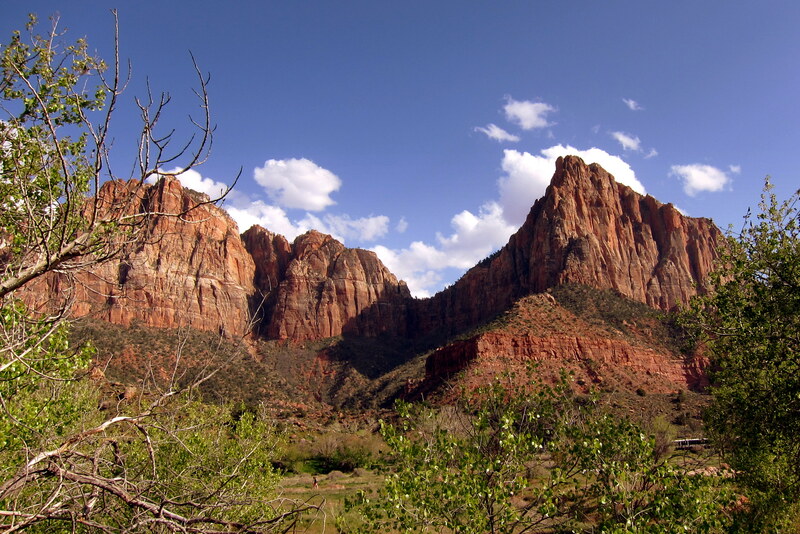 Hope we get back to Zion NP another time, I love the scenery there.